A high school student is sexually assaulted at her locker after she oversleeps on a Monday morning. The suburbs have become communities filled with religious intolerance, sexism and racism, a young writer shares in her poetry. A veteran hits rock bottom following a friend’s death but overcomes guilt, addiction and PTSD during a journey to rediscover himself. For a second consecutive year, winners of the 2017 Walter F. Spara Writing Competition focused on social issues. 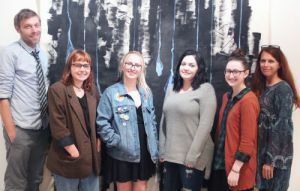 The outstanding writers were recognized at an awards reception on Wednesday, Nov. 15, in the Anna Lamar Switzer Center. In the short story category, Abbigail Andrade’s “Just Another Monday” won first-place. “My story was loosely based on an incident that occurred in high school. It’s a bit exaggerated but sexual assault is such a relevant issue today with real victims,” she said. She said she was inspired to write the poem after driving past a subdivision under construction. “I just thought about America today and how suburbia is a microcosm of our country right now,” she explained. Joshua Olson experienced a lot of self-guilt after he didn’t answer a late night phone call from his close friend, John. The next morning, his father woke him with the news that John had been shot and killed. Olson’s essay, “Learning Me Again,” won third place and shares his path to redemption. “It’s an essay about going through a lot of challenges and coming out better on the other side,” he explained. Sara Smith, Pensacola State English and Composition instructor, said it was tough selecting winners this year.